I was totally looking forward to go trekking at remote countrysides of Laos. 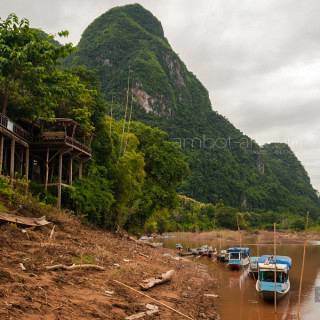 Visiting the riverside villages of Northern Laos seemed like a perfect fit. I traveled to Nong Khiaw from Luang Prabang by bus and got on a scenic boat ride along the Nam Ou river to off-beat Muang Ngoi Neua. I stayed the three days in Muang Ngoi Neua, wandering around peaceful rice fields surrounded by picturesque limestone formations and then spent another night in Nong Khiaw just to see a bit of the town. The boat ride from Nong Khiaw to Muang Ngoi Neua alone was worth the trip! I totally dug the local feel and the majestic riverine views. The weather was cloudy the entire time I was there, which made the trip less photographically rewarding but it also provided a captivating off-beat vibe throughout my journey. 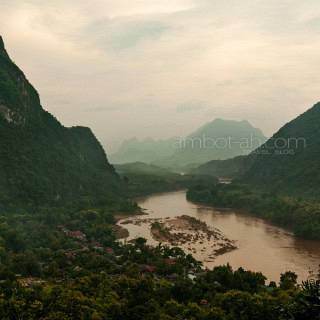 This part of Laos is famous for steep forest-covered limestone cliffs jutting out from its winding river system. There were trekking and waterfalls tours offered but it was low season at the time, so I didn’t think there would be a high chance I could just join one. Instead, I followed the trails leading out of the main village and walked my way to farming communities just a few kilometers away. Bus trip was delayed for around 30 minutes because of ongoing road repair caused by a landslide along the highway. Yali from Alonhe Guest House greeted me at the top of the steps and offered to let me see their guest house nearby. Beautiful view of the Nam Ou river and surrounding mountains from the balcony right outside my room. 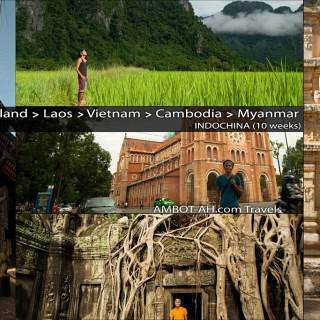 Cheapest hostel I stayed in Laos so far. Rooms at Alonhe Guest House was definitely great value for money. Yali, one of the super friendly staff made my entire stay highly enjoyable. Yali and her family also served delicious meals at Skybar restaurant. Totally recommendable! The food tasted great and the staff were super nice. Really salty and expensive. I did not enjoy the meal. The only good thing about this restaurant was the great view, which I also didn’t get to enjoy since it was raining. Took me around an hour’s walk. Did not realize it would be such a long and tiring. 10:00am already left (last bus on the schedule). Fortunately, there was an 11am songthaew headed to Luang Prabang.